Computer-based electronics are, of course, not new to the medical field. We have seen the wonders of advanced imaging technologies like MRI and CAT scan and newer methods that open up vistas for diagnosis and treatment. We are witnessing forward strides in robotic surgery. The list goes on. As specialists coming to this field from the embedded computing arena, we find the medical field of applications particularly exciting because it combines many aspects of control, sensing and advanced intelligence in the same devices. We also know that what may seem prohibitively expensive today will soon become much less so. Today, for example, a dentist can afford a digital X-Ray system, but the price for one that could be used in a clinic for routinely taking images of bones, muscles, etc., would cost in the multiple hundreds of thousands of dollars, primarily due to the cost of the image sensor arrays. However, as applications for imaging expand and the demand for the underlying sensor technology increases, these devices are being manufactured in greater volume, the expertise at fabricating them is increasing and costs will come down. The ability to have what used to be normal X-Ray images on transparencies that a doctor would put on a light panel and examine, and perhaps call a colleague into the room for another opinion, will soon be multiplied. Soon that same doctor will be able to email the image to a remote specialist and consult over the Internet. Multiply this one example by all the diagnostic and clinical information that will eventually be available in digital form, and the possibilities appear limitless. The additional promise of embedded intelligence to this field is that it is possible to embed not only compact electronics but also certain aspects of medical expertise that extend and enhance the ability of the qualified MD to apply his or her knowledge and experience. 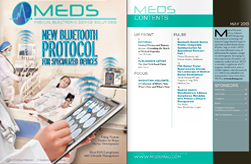 Not only can lower-level medical technicians apply these devices for a “green light” or “alert” reading that would require the attention of a physician; they are often also applicable in the home for use by the patient. This will translate not only into the broader application of medical knowledge, but also into the ability to recognize impending danger signs and being able to intervene much quicker—which really means it will translate into the ability to save lives and prolong the quality of life. That quality of life will be further enhanced by enabling elderly patients to stay longer in their own homes due to network-connected monitoring devices. This ability to capture data on a daily or routine basis as opposed to the need to make appointments and go to a medical facility for the procedure has huge advantages. First, it can be evaluated at one level on the device, which can signal alerts if needed. However, it is also then available for further analysis and consultation. It will further be preserved in a patient’s electronic medical records once that system has become better established. This, of course, comes with myriad security and privacy issues. And all this depends on device connectivity and the compatibility of data. There are currently major efforts underway to be able to establish and certify the interoperability of medical devices and their data. The latter, making the devices interoperable, is one of the important topics we will be exploring here—along with the design considerations, both hardware and software, certification hurdles, and the almost endless possibilities for the use of embedded computer intelligence to improve and expand health care. We think these pages will bring a fresh look to the subject given our extensive experience in the world of embedded systems. Contributions from leading players in the medical arena along with those of experts in semiconductor and digital technology will make every issue of MEDS an exciting and stimulating read. It is often that through such cross-discipline dialog that brand new ideas and innovations arise. We are intending that MEDS will be one of those places and invite our readers to comment and offer insight so that we all—along with the public in need of ever better health care—can benefit from the exchange.